K5 Heavy Duty knife and cap. 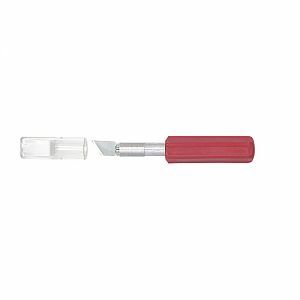 Heavy Duty plastic red handle, With 7/16" Aluminum adapter for secure blade positioning, includes #20019 blade or other with a Snug fitting plastic Safety Cap or Scabbard for your protection. Used for precision cutting, trimming and stripping of paper, plastic, and wood.